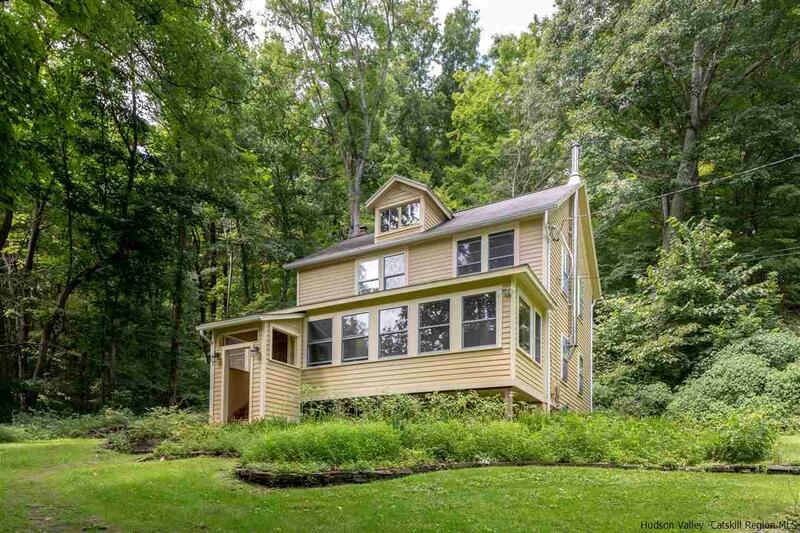 This charming house on a hill is surrounded by the lush landscape - and is only a few minutes to either Kingston or Rosendale (with plenty of amenities and ways to get to/from NYC! ), making it a pretty perfect location for full-time or weekend buyers. The home is tucked back from a windy country road that's chock full of lovely old homes, and one of the entrances to the rail trail for biking and walking is a short distance away. A charming outbuilding with electricity and plenty of windows is currently being used as a workshop but could be repurposed for guests, writing, yoga, etc. The first thing you see when you walk in the home itself is an incredible three-season porch leading to a spacious living room. The views from the eat-in kitchen and small back patio are one of the loveliest moments in this property, giving you a sense of privacy and being surrounded by nature. There are hardwood floors and plenty of historic details in the 3 ample-sized bedrooms - and 2 1/2 bathrooms, including one in a master suite, maximize the relatively small and easy-to-maintain square footage. Copyright © 2019 Multiple Listing Service of Ulster County, Inc. All rights reserved. Information deemed reliable but is not guaranteed. The data relating to real estate for sale on this web site comes in part from the IDX of Multiple Listing Service of Ulster County, Inc. Real estate listings held by brokerage firms other than Halter Associates Realty are marked with the IDX logo and detailed information about them includes the name of the listing broker. Information provided is for consumer\'s personal, non-commercial use and may not be used for any purpose other than to identify prospective properties consumers may be interested in purchasing. This site will be monitored for \'scraping\' and any use of search facilities of data on the site other than by a consumer looking to purchase real estate, is prohibited. The listing broker has attempted to offer accurate data, but buyers are advised to confirm all items. Information last updated on 2019-04-21.